Rated NR for sexual content and language. 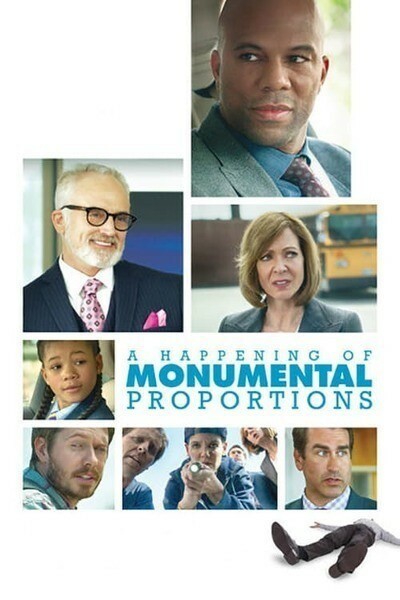 Judy Greer assembled a monumental cast for her directing debut, “A Happening of Monumental Proportions.” Then she stranded her fellow actors with material that doesn’t even begin to tap into their talents. Common, Storm Reid, Anders Holm, Jennifer Garner, John Cho, Kumail Nanjiani, Rob Riggle, Katie Holmes, Allison Janney and Bradley Whitford (although never at the same time, for those of you hoping for a mini-“West Wing” reunion) are all stuck playing barely-there characters in one of those intertwined-Los-Angeles-lives movies. It’s sort of a dry, dark comedy but it’s also sort of a sweet, sentimental drama; rather, it occupies an uncomfortable middle ground where nothing resonates in either direction. Why Greer would choose this story to tell for her first filmmaking foray is puzzling. A longtime standout supporting player—she’s equally great as dippy secretary Kitty on “Arrested Development” as she is in the Alexander Payne drama “The Descendants”—Greer has always made inspired choices and left an appealingly off-kilter impression within many an ensemble. Here, she’s gathered her own ensemble, but the script from Gary Lundy woefully wastes everyone’s abilities. Greer also has trouble navigating the tricky tonal shifts that abound throughout the film’s jam-packed single day. She awkwardly makes light of serious occurrences while also failing to achieve the emotional heft she seeks as her storylines wrap up at the end. We begin the day with various characters heading off for work and school; by sundown, we’ll see how they’re all linked and supposedly experience some sort of profound feeling of connectedness. Janney and Riggle play administrators at a private school who discover the body of a gardener on the morning of Career Day, when parents come to talk about their jobs. Jaunty music plays clunkily as the two struggle to drag the corpse up a flight of stairs and hide it in the teachers’ lounge. (Then again, jaunty music needlessly punctuates a multitude of scenarios here.) Holm plays Mr. McRow, the school’s depressed music teacher who shuffles like a zombie through his day, smokes multiple cigarettes at once in front of his students and offers them dour life advice. Cho frustratingly shows up in maybe two scenes as the stoic shop teacher. Common’s Daniel has plans to come to school later in the afternoon to talk about his work in publishing; Reid, who was such a breath of fresh air as the star of “A Wrinkle in Time,” plays his daughter, a kindhearted and conscientious sixth-grader. It’s just the two of them now since her mom died. But Daniel has been having an affair with his married assistant, Nadine (Garner in a truly thankless role that requires her to do little more than be profane in a pencil skirt), a plot point that seems to have been introduced simply for shock value. This comes to light when Whitford’s character, a corporate hammer who’s been sent to investigate a broken coffee machine, begins asking questions. (Whitford’s understated, withering demeanor is good for a vague chuckle here and there.) So not only does Daniel lose his job over the fling, he also must face the wrath of Nadine’s husband, who insists on confronting him once he’s done with Career Day. The identity of who plays the betrayed husband holds such promise and is perhaps the biggest casting waste of all. Meanwhile, back at school, the paramedics have arrived; they’re played by Holmes and Oscar-winning “Descendants” co-writer Nat Faxon in a bizarre bit of stunt casting. Their entire raison d’etre is to show up and be surly, one of the movie’s many examples of gratuitous, inappropriate behavior that goes nowhere. The proliferation of raunchy humor isn’t necessarily offensive, it just feels like a lazy screenwriting device to inject an irreverent edginess to these mundane settings. Also at the school, Reid gets trapped in a contrived subplot in which the sensitive, nerdy new kid (Marcus Eckert) asks her to be his girlfriend within minutes of meeting her, then sobs when she politely rebuffs him. Greer jumps jarringly between all these various stories until they reach their collective conclusion. The worst example of this is when she cross-cuts between the brokenhearted kid opening up to his suicidal teacher on the roof, and two parents engaging in a knock-down, drag-out brawl on the ground before an aghast crowd of onlookers. So actual, monumental things eventually do happen here, but they don’t even come close to registering the way they were intended.